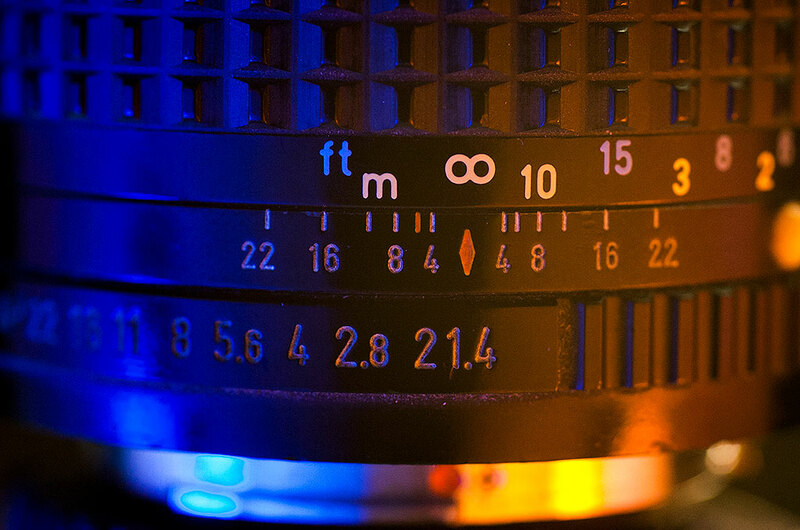 Blue light shines through a big, old Pentax K-Mount 50mm f/1.4 lens. Periodically my photographer friends and I will talk about how much we miss film, particularly how much we miss certain cameras and lenses. Wouldn’t it be neat, we speculate, to get back into shooting film, if we only had a camera. 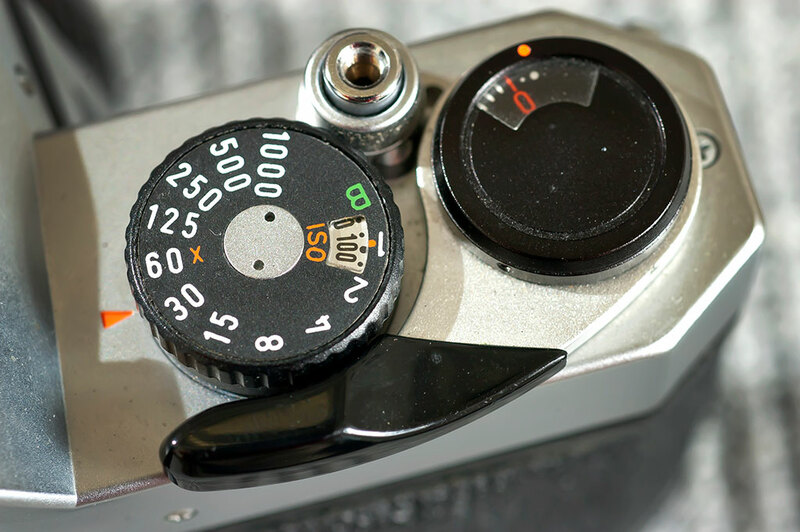 The top panel of the Pentax K1000 is a model of simplicity: shutter release, shutter speed dial, film counter and film advance lever. But, of course, film cameras are still around. I’ve got one in my hand as I write this. I pulled the Pentax K1000 out of the display case in the entryway at our office. This camera is one of the most basic, simple, easy-to-use cameras ever. Its simplicity made it popular with photography teachers, since the camera is entirely manual, and required students to learn how to do everything. I could shoot film right now if I wanted to, but the truth is, digital photography is overwhelmingly popular because it is overwhelmingly better than film. That wasn’t the case 15 years ago, but today, digital imaging technology has surpassed film tech in all respects. 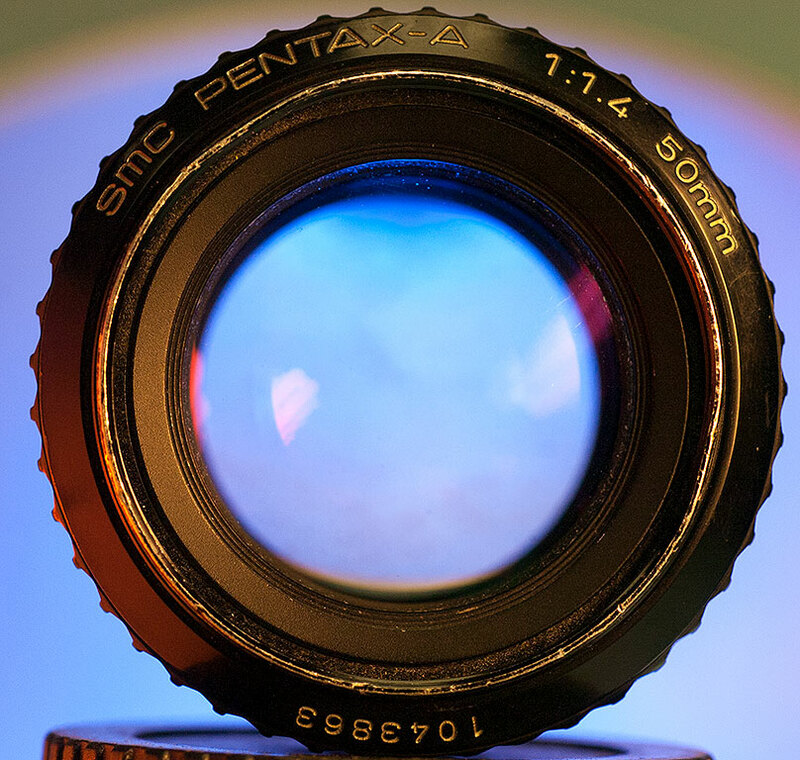 Few things make photographers smile more than a large maximum aperture lens, like this Pentax 50mm f/1.4. So despite the fact that I have this perfectly-workable Pentax, I have no desire or intention to try to buy film, shoot it, and have it processed somewhere, then either print it or have it scanned. We photographers are happy in our digital world, and despite Jonesing for the old days, we live in the new world of photography. There are few cameras as straightforward and fundamental as the venerable Pentax K-1000. This one was used for many years by reporters at my newspaper before being retired to the downstairs display case. It works perfectly to this day. 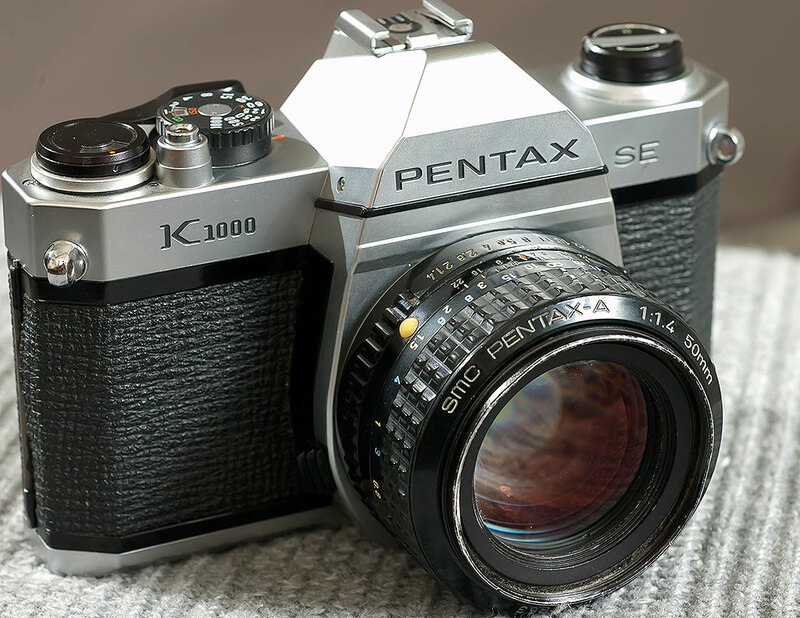 I trained on the Pentax K1000 in the early days of my newspaper career, 1989-1990, just on the cusp of the digital revolution in all aspects of print production. Looking back on my experience with the camera, I have to say it was a complete pain in the a–. I can’t imagine going back. I can’t even say that I achieved anything close to a level of competency with it. I fought with it as opposed to learning it. Coupled with this was the absolute necessity of learning darkroom tech. We already had a darkroom guy; he also happened to be our staff photographer. He did everything, from maintaining our photographic supplies to souping the negs to processing the day’s prints. It was fun and I spent many hours under his tutelage but I never had any desire to do it myself because the technology was so unsound (everything was subject to light leaks) and I despised working with the chemicals. Digital changed everything. It was interesting to enter the field just as it all was about to change from physical, handmade production to what it is today. Me, I’d never go back to the film days, but it is fun to reminisce and romanticize. I think this tendency permeates many disciplines and topics. Books (bound v. ebooks), music (vinyl v. digital), movies, etc. Those who are accustomed to the old ways tend to prefer them. At least for some personality types. I’m generally immune to that tendency, always hungry for a better way to do things. My only hangup with new tech is: I’ll wait until it’s been out long enough to work out the bugs.